Animal Man’s Dinosaur Encounters provide the best Dinosaur Parties in Newcastle. It’s a great show, with loads of fun. 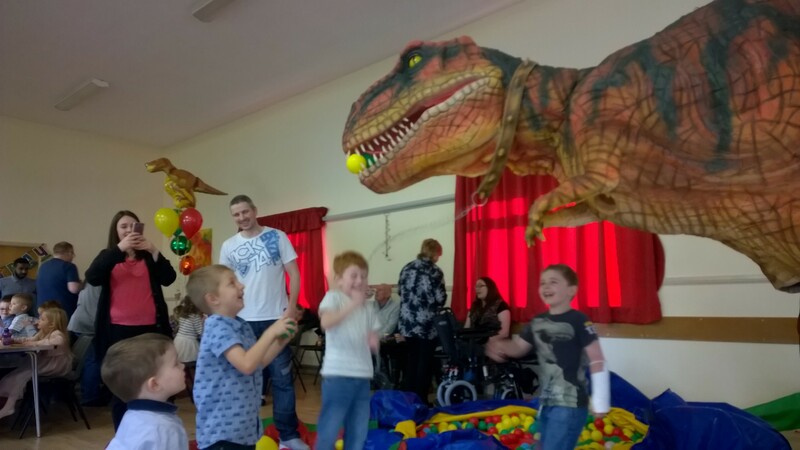 Our Giant T-Rex Barnie is the star of the show and will make your little one’s birthday party one to remember. It’s not just a costume dinosaur, it’s a T-Rex animatronic, so it’s like nothing you have seen before. Our Dinosaur Party Newcastle is presented by Kevin our Dinosaur Wrangler who has 15 years experience in children’s entertainment so it’s going to go down a treat. Barnie arrives in a big horse box and makes a huge entrance. We’ll have the kids super excited and then play games and interact with Barnie. Kevin our Dino Wrangler does a 10 minute party intro, and sets the kids up for a massive surprise when Barnie walks in. We also bring a snake, bearded dragon lizard, tortoise and rat, and finish off the party with some animal handling and interaction. It’s very easy to book, all we need is a date and venue address and we can check dates and get you booked in the diary. You can email animalmansminizoo.org.uk or call Kevin on 07957-382-580. Our Dinosaur Party Newcastle is something new, and something most people haven’t seen, so if you want an original party get in touch. Hi can availability for the dinosaur party in Northumberland, Matfen for Sat 11 March and price if available. Sorry we are fully booked over that weekend. Hi Laura, I will email you now with prices. Hello. I was wondering if you could give us prices for a 5th birthday party in West Allotment. Newcastle. Sun 15th october 2017. Is it possible to just hire the dinosaur only? Or is it a whole package? Thank you. Wondered what your availability was like for Newcastle over a weekend sometime in March? I am enquiring about the dinosaur party for my son’s 5th birthday. What is the cost? Do I hire the venue then advise where the party is? I don’t have a date in mind but sometime mid July would be great. His birthday is August so try and fit the party in before the sxhool holidays start. Hey Lucy, I will send you an email now. Sorry we are only covering Scotland just now.